Is it common for concert organizers to set up a website for a “one time gig”? I honestly did not know what to say. 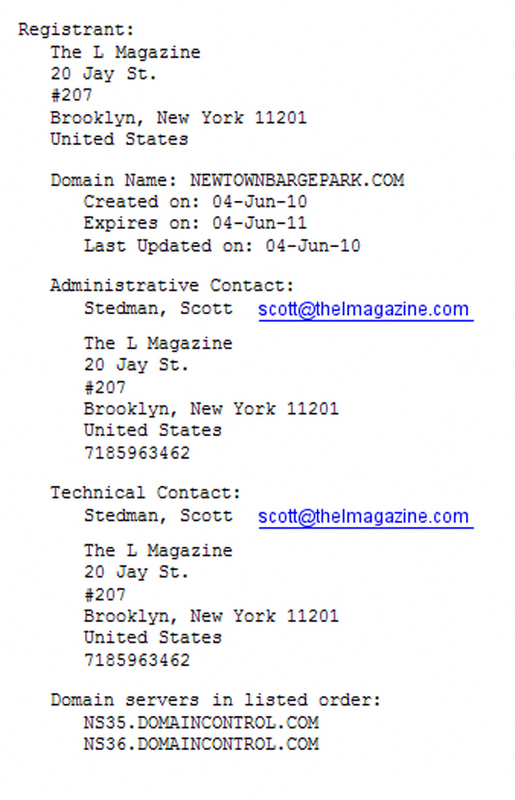 So I looked up the owner of this site instead. So much for keeping it local. Thanks to the efforts of the Newtown Creek Monitoring Committee (NCMC) and Barge Park Pals, a parkhouse with comfort station will be built in Greenpoint Playground. 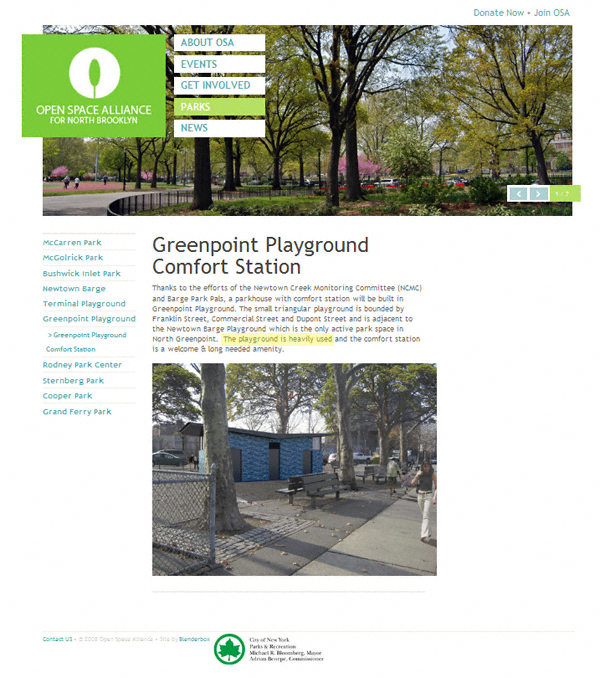 The small triangular playground is bounded by Franklin Street, Commercial Street and Dupont Street and is adjacent to the Newtown Barge Playground which is the only active park space in North Greenpoint (and yet Ms. Thayer et. al. saw fit to commandeer part of it for a concert. — Ed. Note.). The playground is heavily used and the comfort station is a long needed amenity. So let me get this straight: it “is heavily used” and yet, Ms. Thayer, our Parks Administrator and Executive Director of OSA, told a reporter from the Williamsburg Greenpoint News + Arts this same park was (and I quote) “underutilized”? So which one is it, Ms. Thayer? Or by “underutilized” do you mean by those willing to pay $12.00 to enjoy a park their tax dollars are already (ostensibly) paying for? i don’t think it is a contradiction. can it not be both heavy used and underutilized, meaning it has a lot more potential? so, there was a benefit concert in a public park slightly inconveniencing a birthday party, some kids overhear the F word, the organizers had the nerve to provide port-a-johns, and they even set up a web-site which as we knows is almost impossible to do these days..
why are you so strongly against an organization that is promoting open spaces and parks in our area? Those L Magazine/Northside Festival assholes left the park in shambles. On Monday morning, there were piles of trash, tents, tables, broken bottles, etc. Even today the port-a-potties for the festival were still in place. Are those jerks still paying to use the space, or can anyone just leave their crap in the park? As for park users, folks are there all the time, despite the park’s condition. Dear Taco, What is it that you see as “promoting open spaces” in OSA’s works ? Concerts ? Artists and Fleas? 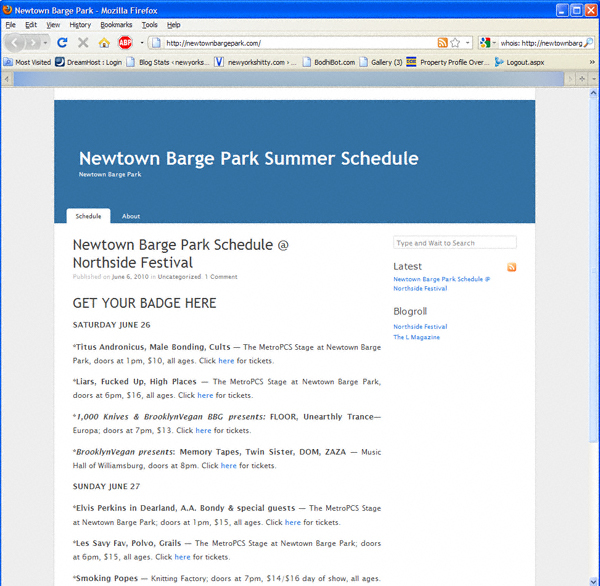 They do exploit parks for monetary gain, but that is not playing out as support for the parks. 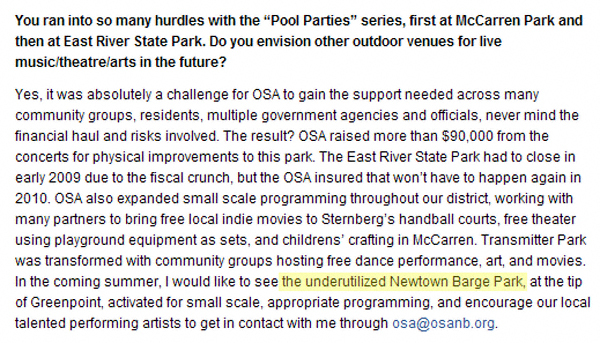 The Open Space Alliance OSA-NB is the Gen X version of The Prospect Park Alliance. When PPA got involved with Prospect Park 30 years ago they asked, what can we do for this park ? OSA, by way of hijacking all the North Brooklyn Parks with Stephanie Thayer’s official NYC Parks department stranglehold asks, what can these parks do for US? Answer: they provide places to put on concerts and events. Even as rank amateurs at concert promotion and alienating Jelly and any other entity that might have some level of experience in this arena, OSA is certainly persistant. That is all well and good, IF they gave back to the parks more. When they do “give back” it is like getting blood from a stone; and yet they will STILL all pat themselves on the back for another job well done. I feel sorry for the members of OSA that do want to do good works, but their fearless leader needs a total psyche transplant before that could happen. i’ve lived in GP for the past 8 years and i think it’s great that there was a concert here last weekend. i thought it was a great use of the space. if there was some trash left over afterwards, that is something that needs to be addressed before the next event, but it should not prevent other concerts from happening. like taco, i must also be missing something, or it just seems like people have to have something to complain about. This is a children’s playground. Not a concert hall or bandshell. Playground are meant to serve children. Children should not be displaced from a playground to accomodate adults. Adults have the mental capability to make more appropriate plans. People that use the playground every weekend were shut out because of a private, not public event. There was liquor, marajuana,and a group named “Fucked Up” in the playground when the kids were playging nearby. The band’s content was not appropriate to be heard accross a children’s playground. Any mature adult would understand that concept. As a parent and grandparent, I don’t expect my child to go to a children’s playground and be exposed to adult entertainment. Trash is the least of the problem. Concerts should be planned in appropriate spaces. Frankly, this type of behavior in a playground is grounds for an ACS report. I was born and raise in Greenpoint. Nobody ever called that Greenpoint Playground. It was always known as Dupont Park. Re the proposed comfort station, there used to be one. Shortsighted and ill-advised budgetary decisions are the reasons that this is even under discussion today. It was the park attendant’s storage room/office; and, it was located in the middle of the park, adjacent and parallel to Dupont Street. The Boys’ bathroom was on the east side of the building, facing Franklin Street; the Girls’ was on the west side, facing the intersection of Dupont and Commercial Streets. This park house was abandoned in the mid 1970’s during the budget crisis, and it was demolished in 1980-81. The park attendant, when I was growing up, was an old Russian man who was known by everyone as “Joe the Parkman”. Every autumn, Joe would rake the leaves into a big pile next to the rear entrance of the park and let the kids jump into the pile before he would burn the leaves. Yup, that’s right. Those were the good old days before everyone was afflicted with that dreaded disease known as “environmentalism”. There’s nothing which compares to the wonderful, spicy aroma of burning leaves wafting through the neighborhood on a brisk October day. The park was surrounded by a cyclone fence, with entrances located on Franklin Street, in the middle of the block between Dupont and Commercial Streets, and at the northwest corner, facing the ballfield on Commercial Street. There was a small concrete staircase at the Franklin Street entrance. To your left were the swings for older kids. These were the old style swings (six of them) with flat aluminum seats attached to the frame with linked eye rods. These were the swings that the older kids would stand on and swing themselves almost to the top of, and perpendicular to, the support bar at the top (15 ft. from the ground). Directly in front of these swings was a fairly large (about 15×25 ft.) sunken concrete sprinkler pool which was surrounded by a cast iron fence. The entrance to this pool was located directly opposite the park house, which was a rectangular structure approximately 12×20 ft. Continuing to the other side of the park house, walking toward the sewage treatment tank, there were four benches, with concrete frames and wood slat seats, located along the Dupont Street-side of the fence. Next to the Commercial Street entrance, following Commercial Street back towards Franklin, was every kid’s favorite – the monkey bars. Just past the monkey bars, along the Commercial Street fence, were the baby and toddler swings. There were six of these. The seats were square aluminum buckets with a vertically sliding safety bar at the open front. Civil lawsuits against the city weren’t something which affected playground design back then. Next to the kiddy swings were the slides and see-saws and more benches. Finally, located at the Franklin/Commercial Street corner of the park, was a concrete sandbox, surrounded by a little cast iron fence. I hope my description was vivid enough to allow you to visualize, with your mind’s eye, the way Dupont Park looked forty-five plus years ago. Wow, SGI. Thanks for taking the time to give me (and many others) a full rundown on how this park used to be! My pleasure, missheather. Greenpoint, despite its post-industrial grime and grittiness, is near and dear to my heart. This always was a blue collar working class neighborhood, where everyone knew his neighbor and everybody helped each other. I’m in total agreement with SplillConspirator, in that, these are city-owned, PUBLIC parks and playgrounds. They are not, and should never be considered or utilized as, staging areas for private events. Ever since Greenpoint and Williamsburg were inundated by waves of “artists” in the early to mid 1990’s, one could see how these interlopers (that’s right, interlopers. I’ll not retract that) bruted their version of culture upon the community, as if the locals were some ignorant aboriginal group in need of civilizing by their superior, smarmy ways. I gag at what happened to the Park Luncheonette, across from McCarren Park. I want a burger, not artisanal food suitable for framing. I’m sick and tired of all the private entities taking over the parks for the purpose of lining their own pockets by holding these events and thereby preventing the use of these public areas by the community. We don’t care for overamplified noise disturbing the relative tranquility of our parks. We don’t care for the flea markets operating in and around our playgrounds. Hike over to the East Village and sell your schmatas in front of Cooper Union. You want to stage an event? rent out an auditorium or hall. There aren’t any in Greenpoint? Gee, tough noogies, slick. Keep moving. There’s nothing here. Don’t attempt to transform this neighborhood into some pseudo-retrograde hippie commune.